De La Salle Alumni Association (DLSAA) and Petron Corporation forged a partnership through the DLSAA – Petron Value Card (PVC). DLSAA President Dr. Nelson Arboleda, Jr., DLSAA Executive Director Dr. Joaquin Moreno, Petron Corp. General Manager Engr. Lubin Nepomuceno, and Petron National Sales Manager - Cards Mr. Gregorio Abada signed the memorandum of agreement for the DLSAA - Petron Value Card last January 24 at the Manila Golf and Country Club. The PVC is a flexible, fully customizable, high-technology RFID card that runs on a proprietary and fully secured electronic system platform. It is honored in over 2,000 Petron stations nationwide. One (1) point earned per Php 100 purchase of Petron Gasul. Points and history of transactions may be viewed through Petron Value Card Mobile App. Aside from the abovementioned benefits, Petron also offers a special discount on gasoline (Petron Blaze 100 Euro6, Petron XCS, Petron Xtra Advance) and diesel purchases (Petron Turbo Diesel and Petron DieselMax) in the form of rebate/cash back through points that are accumulated in the PVC. Please see the table below for the mechanics. Half of the points earned through this program will be donated to DLSAA while the other half will go directly to the cardholder. Moreover, the monetary equivalent of the points earned by DLSAA through this program shall be used for the DLSAA Scholarship Fund. 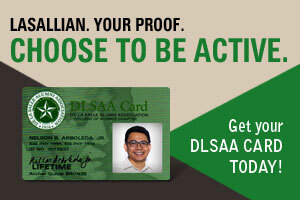 Interested individuals may get their DLSAA – Petron Value Card for free at the DLSAA Office, located at Rm. 101 Br. Andrew Gonzalez Hall, DLSU, from 9:00 AM to 6:00 PM, Mondays – Fridays and 9:00 AM – 12:00 NN, Saturdays. It is also available at the STC Campus Services Office, located at W104 Milagros R. del Rosario (MRR) Building, DLSU Laguna Campus, from 2:00 PM to 4:00 PM, Mondays – Fridays. For questions, you may call us at 524-4611 loc. 122 or e-mail info@dlsaa.com.